Bacon has always held a place at the breakfast table, but the slippery delight has lately been relegated to nothing more than a way to feed a greasy-fatty food fix. That is, until Bigi Voix, a staunch vegetarian, had a life-altering brush with bacon that forever changed her and the Bay Area art scene. She fell off the vegan wagon over a bacon-binge weekend and became inspired, or more like obsessed, by pork in strip form. 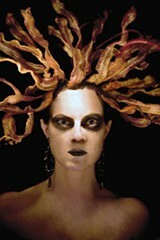 Her passion evolved into a photography collection, where bacon interplays with Voix herself as model. Voix's first series is on display in Napa through the end of the month. The portraits range broadly, from a 1950s pinup pool girl with a beehive hairdo done up in bacon to a recreation of Bruce Springsteen's classic Born in the USA album cover with bacon stuffed into the Boss's back pocket instead of a baseball cap. Each photo is accompanied by a snarky write-up that speaks to the artist's inspiration, and joined by sometimes fearful factoids about bacon, like the differences between fat and lard and stats about the average American's bacon consumption. In concert with the exhibit, Silverado Brewing Company is offering bacon specials all month long. The photos will be available come 2011, in calendar form—the perfect gift for the meat-loving fiend in your life. Whether you love bacon, hate it or yearn to bring a little of Bigi's bacon to a home near you, don't miss out on this one-of-a-kind display of art in the making. Bigi Voix's bacon series runs through December at Silverado Brewing Co., 3020 St. Helena Hwy., St. Helena. 707.967.9876.